Sometimes children wonder if they are ever going to use the skills and concepts they are learning in school. Launch a Rocket into Space (You Do the Math) by Hilary Koll and Steve Mills goes a long way to help answer that lingering question by showing children important real-world applications for math. So starts a journey into space that uses math at every step of the way. Michael helps the reader compete the math exercises while guiding a younger female trainee. Together they learn about everything from fractions to timelines. The first activity involves evaluating data about astronaut candidates to select those that fit the height, age and eyesight criteria. A few problems will require a protractor to measure angles. Although the illustrations are often set up in panels with conversation bubbles like cartoons, the graphic-style illustrations are bold and serious, not lighthearted. They are likely to appeal to visual-learners and reluctant readers, as well as fans of serious nonfiction. Want to take a look for yourself? Check this preview at Google Books. Launch a Rocket into Space is perfect for homeschoolers and after school math clubs because they can be entirely child-directed reading with answers to check in the back. Other books in the You Do The Math series follow a similar format, but feature other fields such as police work in Solve a Crime and being a pilot in Fly a Jet Fighter. Although recommended for ages 6-8, these books could also be useful for older children who are struggling with math concepts or don’t quite see how the math they are learning might be useful. They would also be useful for children researching certain careers by giving them more realistic expectations of what might be required to perform certain jobs. After all, it is only rocket science! When we think of promoting STEM books for kids, we usually think of nonfiction. Fiction can play a role as well, however, especially for the middle-grade reader. In the middle-grade novel Something Stinks! by Gail Hedrick the main character, Emily, is an aspiring writer who finds out that science can help answer tough questions. A lot of things change during middle school. Emily is discovering that her friends are looking and behaving in unexpected ways, and she isn’t sure how to react. On top of that, piles of fish are dying in the river near her uncle and aunt’s farm, and Emily wants to know why. Is it run off from local farms, pesticides from a nearby golf course, or pollutants from a local factory that are causing the fish to die? Will she be able to solve the mystery without getting into trouble and losing all her friends? The waters are not always smooth as author sets up the characters and their conflicts in the beginning of the book. Once the story was underway, however, it becomes a compelling page turner. In fact, Something Stinks! was chosen by the National Science Teachers Association – Children’s Book Council’s Outstanding Science Committee as an Outstanding Science Trade Book in 2014. It’s Women’s History Month, and what better way to celebrate than learning about groundbreaking women with Girls Research! 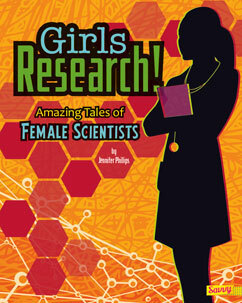 : Amazing Tales of Female Scientists (Girls Rock!) (Girls Rock!) by Jennifer Phillips? Sometimes it may seem like there were only a few significant women scientists in the past because the same names keep popping up. This book changes all that by giving brief overviews of the lives of 56 women scientists. That’s right, 56! Some are famous, some are lost in the annals of history, but all made important contributions to the field of science and medicine. Especially useful is the timeline that records the decade in which the women performed their most historical research. 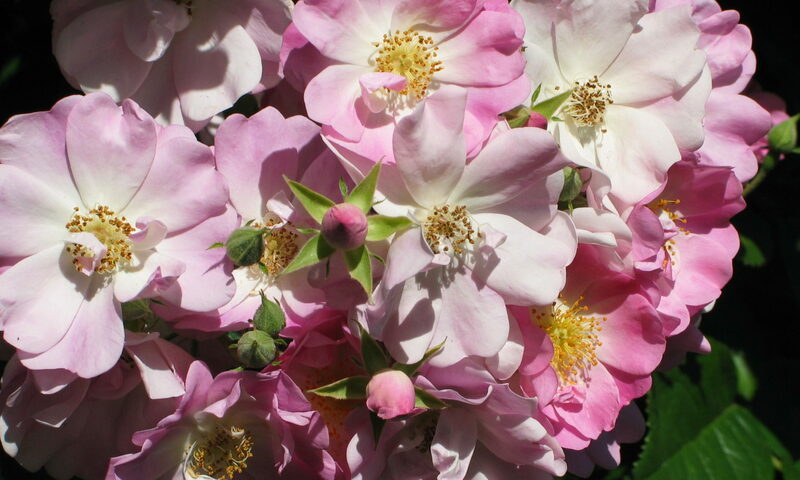 The timeline runs from Maria Mitchell in the 1840s to Elena Aprile in the 2010s. Haven’t heard of Aprile? She’s an astrophysicist who is looking for evidence of dark matter in an underground laboratory in Italy. Girls Research! is the perfect jumping off place to start a research project into women’s history. When children come to you with instructions that their report that must be from a book that is at least 100 pages long, hand them this 64 page book and let them figure out which stories make them want to learn more. 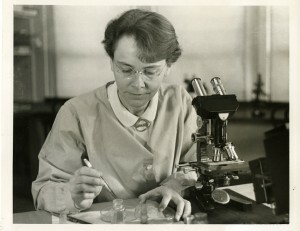 Perhaps the story to inspire them might be that of Barbara McClintock, winner of the Nobel Prize in 1983 for her discovery of jumping genes. Girls Research! : Amazing Tales of Female Scientists (Girls Rock!) (Girls Rock!) by Jennifer Phillips. Looking for more books about women scientists? 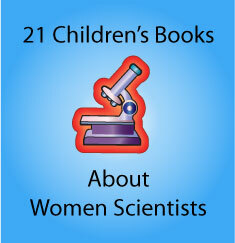 Try our list of 21 Children’s Books about Women Scientists at Science Books for Kids. Disclosures: This book were provided by the publisher for review purposes. Also, I am an affiliate with Amazon so I can provide you with cover images and links to more information about books and products. As you probably are aware, if you click through the highlighted title link and purchase a product, I will receive a very small commission, at not extra cost to you. Any proceeds help defray the costs of hosting and maintaining this website.